Look enchanting in Elsa's iconic Coronation dress from Frozen! This beautiful, satiny dress features a multicolor glitter print on the skirt in a floral pattern. The dress's bodice is also decorated with a multicolor glitter print and features an Elsa cameo. 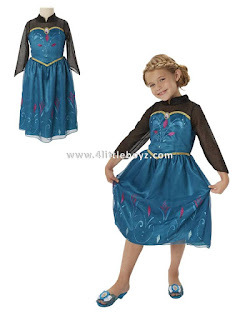 With a high neckline and long sleeves, you'll look just like Elsa at her Coronation Ball!.